I have recently planted three bare root rose bushes on the west side of the house, where they get about eight hours of sunlight. I soaked the canes in water for 24 hours, then they spent a week in a pot while the weather warmed up. I dug a 24 inch x 24 inch trench in the bed and added coconut coir to the bottom for drainage, then mixed the clay soil with the coir around the roses and added a handful of bone meal and a tablespoon of Epsom salt. I topped it off with new topsoil and mulch. After three weeks, the leaves have died off and the canes are turning brown. Do you have any suggestions on how to save them? Add a couple tablespoons of Super Thrive to the soaking water as well and use that to water them in. This helps with the planting shock. Many of the big box stores sell bare root rosebushes with plastic bags around their root systems. Those bags are packed with either wet sawdust or shredded newspaper, sometimes both. 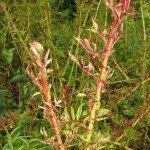 About 90% of those rosebushes have their root systems badly cut off. They look very healthy in the store, but once a person gets them home and removes them from that bag of wet sawdust or newspaper, the badly chopped off root system no longer has that close and ready access to continual moisture. The root system can no longer support any growth, including the green canes. Thus the foliage, if any, wilts, dies and falls off. Next the canes start turning brown and die back severely. A truly good bare root rosebush should have three or four roots approximately 3/16" to a bit bigger in diameter and around 10 inches long. Along with those roots should be some smaller roots that look almost like netting in and around the bigger roots.